This topic lists troubleshooting information related to running QGroundControl on the host computer (e.g. QGC setup and configuration issues). Problems when using QGroundControl to interact with a vehicle are covered in: QGC/Vehicle Interaction Problems. 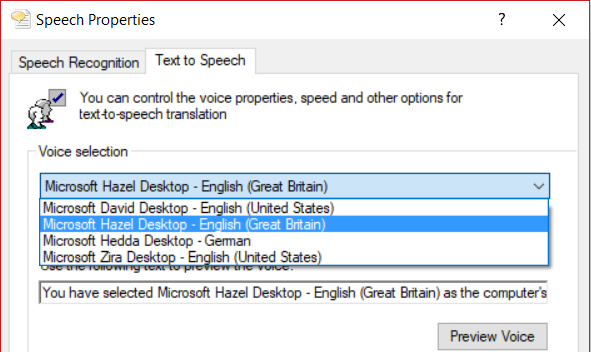 On Windows 64-bit machines QGroundControl may sometimes play audio/messages in a language that does not match the Text-to-speech setting in Control Panel > Speech (e.g. audio spoken in German on an English machine). This can occur because 64-bit Windows only displays 64-bit voices, while QGroundControl is a 32-bit application (on Windows) and hence can only run 32-bit voices. Run the control panel application: C:\Windows\SysWOW64\Speech\SpeechUX\sapi.cpl. Make your desired Voice selection and then click OK at the bottom of the dialog. Additional information about the Windows speech APIs can be found here. QGroundControl: QGC uses OpenGL graphics drivers directly. GPU Compatibility Mode: QGC uses ANGLE drivers, which implement OpenGL on top of DirectX. GPU Safe Mode: QGC uses a software rasterizer for the UI (this is very slow). If QGroundControl sits forever Waiting For Vehicle Connection when trying to connect to the vehicle over Wifi, a possible cause is that IP traffic is being blocked by firewall software (e.g. Windows Defender, Norton, etc.). The solution is to allow the QGroundControl app through the firewall. In the Start bar, enter/select: Firewall & Network Protection (System Settings). Scroll to and select the option: Allow an app through firewall. Select QGroundControl and change the Access selector to Allow. The download/install instructions for Ubuntu include GStreamer setup information.